Before digging into a selection of five regional pastas prepared by our Chef in Residence Sara Jenkins and Test Kitchen Chef Josh Cohen—because we might hazard to say the best tours of Italy are planned around its pasta—the night kicked off with the next best thing: spritzes. The spritzes, recipes from Spritz: Italy's Most Iconic Aperitivo Cocktail, with Recipes, included an Aperol Betty (a grapefruit variation) and and a classic Verona spritz with red wine and lemon syrup to, you know, be Italian. “What I love most about Italian pasta is that in each town, it’s served differently, but every version is accepted as the real one,” Josh said. It’s regional neighbor, Lasagna Bolognese from Romagna, was served alongside it. Sara’s version is the lesser-known version of the classic Southern lasagna most people recognize. Instead of ricotta and mozzarella, it’s traditionally served with a creamy béchamel sauce, made from a white roux and milk. Next up, an incredibly simple dish from Puglia, Ciceri E Tria. “I love this dish,” Sara explained, “because when I first showed it to Josh, he kept saying, ‘Yeah, but what goes into it?’ And I said, ‘Not much—but you’re still going to be blown away!” To make it, we stewed chickpeas overnight in a broth with herbs, garlic, and sweet onions, then tossed the pasta in the broth and some additional crisped chickpeas and sautéed onions. Throughout the evening, the pastas kept coming—Pasta Con Le Sarde from Sicily, made with fresh sardines, raisins, and pine nuts and flavored with saffron, and a Chitarra with Lamb Ragu (the pasta is named for the guitar-like instrument traditionally used to cut the pasta)—until dessert. To cap off the night, the pair served olive oil gelato in a biscotti crumble, and citrus (and one last glass of wine). The filling is ricotta cheese plus whatever greens and herbs you love most. I prefer using rainbow chard, garlic, lemon, Parmigiano, and a little bit of fresh marjoram. 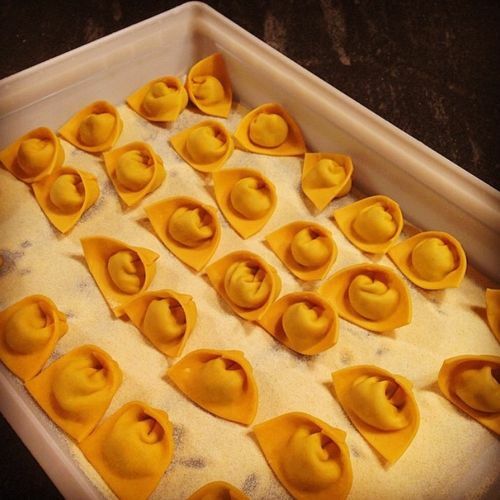 This is fresh handmade pasta, folded into a tortelli shape. The sauce is butter, sage, lemon, and extra Parmigiano to garnish. Psst if you want to see more (Not)Recipes, download our app on the iTunes app store here!